Home Downloads LG Bridge LG Flash Tool LG Hard Reset LG Mobile Flashing LG PC Suite LG USB Driver LG K535D Flash File | Upgrade | Unbrick | USB Driver | Flash Tool Etc. 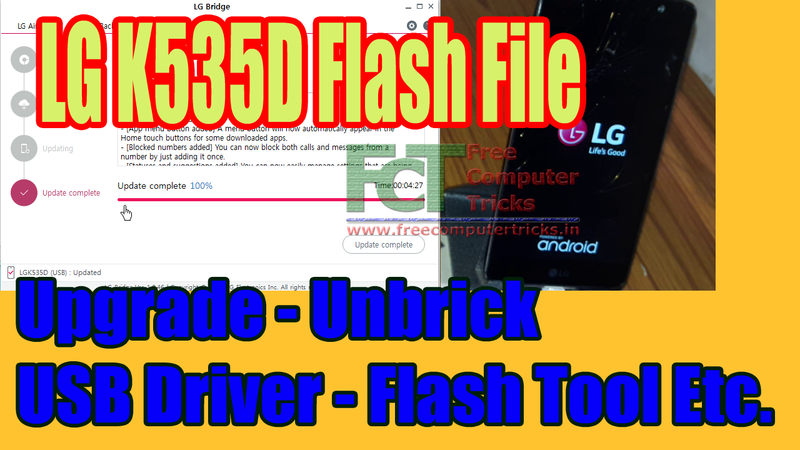 LG K535D Flash File | Upgrade | Unbrick | USB Driver | Flash Tool Etc. Here we provide LG K535D Firmware or flash file and Upgrade Tool LG Bridge and LG K535D USB driver etc. So if you need to flash or Upgrade or recover or unbrick the LG K535D, then here is the all in one solution for all LG phone which can be Upgrade or Flash firmware using Official LG flash tool. To use this tool you must have a Computer with Internet connection and if you are using LG Bridge then no need to download the firmware, the tool will automatically download the firmware for the phone and Upgrade the phone. And here we also given the K535D firmware download link, if you need to download the firmware and use any third party flash tool to flash the phone, along with that you can download LG all Mobile USB driver or LG flashing Drivers and if you need flash your Old LG phones then you can use LG PC Suite. There are to major tools provided by LG one is LG Bridge which is for New models and LG PC Suite which is for Older models. LG K535D Flash File - Upgrade - Unbrick - USB Driver - Flash Tool Etc. This is the best process to flash or upgrade the K535D Mobile using LG Bridge, so the below the download link of LG Bridge and USB driver for K535D, download and install these and visit the YouTube Tutorial to Know how to flash the LG phone using LG Bridge, Tutorial link given below. You can save the LG firmware downloaded with LG Bridge for future use, but after flash complete the kdz file will be deleted automatically, so how you can backup the kdz firmware downloaded through the online upgrade of the phone using LG Bridge. Here I will show you how you can save the LG firmware downloaded through LG Bridge, when you flash or upgrade the phone using LG Bridge, it will download the firmware to the PC and then starts the Upgrade process, at that time when the upgrade process continues you can copy the LG KDZ flash file to the different location on the PC for future use. To copy the firmware first go the the download location of the firmware (given below), where username is your user name used on the Windows PC.